If you are dealing with lighting systems for greenhouses or plant growth, then you will find various information on the products offered by the manufacturers. These include watts, lumens, lux, cd / m², PAR, PPF, PPFD and photon efficiency. We would like to give you a brief overview of which of these values are really relevant to the assessment of plant lighting and how they can be measured. Humans and many other creatures perceive light differently than plants. The eye is differently sensitive to visible radiation depending on the wavelength. In daytime or photopic vision, the light sensitivity curve V (ʎ) applies, which has its maximum at 555 nm (yellow-green). Color-sensitive uvulae in the eyes make it possible for us to recognize colors unequivocally. In the case of night or scotopic vision, the light sensitivity curve V ‘(ʎ) applies, which has its maximum at 507 nm (blue-green). Light-sensitive rods in the eyes make it possible for us to see at these minimal levels of brightness, although we’re no longer able to recognize colors. All photometric measures, which include lumens, lux and cd / m², reflect the brightness impression of humans in daytime vision. That means the spectrum of the light is evaluated with the light sensitivity curve V (ʎ). 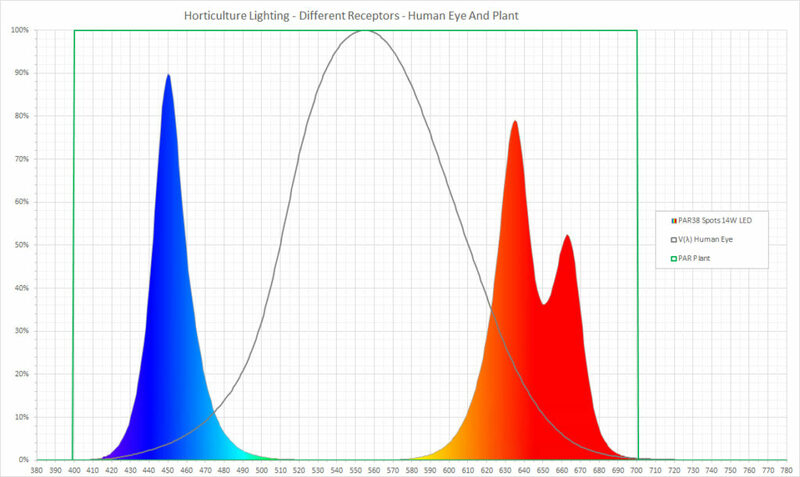 The fundamental problem in using normal illuminance or luminance meters to measure plant illumination is the undervaluation of blue (400-500 nm) and red (600-700 nm) light in the visible spectrum. In these area humans have only a reduced sensitivity, but especially plants use blue and red light intensively for photosynthesis. The above-mentioned photometric measurements are therefore not suitable for the assessment of plant lighting. The photosynthetic active radiation PAR is the proportion of electromagnetic radiation from 400 nm to 700 nm of the visible light spectrum, which drive photosynthesis. The amount and the spectral composition of the PAR light are essential parameters for the assessment of horticulture lighting systems. How much PAR, measured as photosynthetic photon flux PPF, does the system produce? How much PAR, measured as photosynthetic photon flux density PPFD, is arriving at the plants? It makes limited sense to have only an integral value for PAR over the entire range of the spectrum because the effect on plants is spectrally dependent. The photosynthetic photon flux PPF with the unit μmol/s (micromoles per second) is the total PAR generated by a lighting system per second. This value is usually measured in the light laboratory with an integrating sphere and a special measuring device. It does not say how much of the measured light actually lands on the plant, but is an important measure of how to calculate the efficiency of a lighting system to produce PAR. The photosynthetic photon flux density PPFD with the unit of μmol/m2s (micromoles per square meter per second), is a measure of the amount of PAR that is actually available to plants. It represents the number of photosynthetically active photons falling on a given surface every second. In the case of an illuminated planting area, it is not sufficient to measure at only one point, as there is usually no uniform illumination. Often the light intensity in the middle of the lighting system is strongest and decreases towards the edge of the crop surface. It is therefore advisable to define a measuring grid over the cultivated area, to carry out several measurements and to document the horizontal and vertical coordinates together with the measurement result. From the determined values, the mean value PPFDavg and the irregularity PPFDmin / PPFDmax can then be calculated. The efficiency of a plant illumination system is often expressed as the ratio of the generated photosynthetic photon flux PPF in μmol/s to the applied electrical power in watts (equal to Joules/s). The unit of efficiency is μmol/J (micromoles per joule). The higher this number, the more electrical energy is converted into photosynthetic active radiation PAR, and the more efficient the lighting system is. A frequent statement of the electrical power in watts, based on the illuminated area in m² is not meaningful, since it does not take into account the generated photosynthetic radiation PAR. The MAVOSPEC BASE measures and displays the spectrum of the horticulture lighting system. It provides a first information whether the wavelength ranges required for plant growth are present and in which intensity they are present. An EXCEL template for data logging makes it possible to record all measured values ​​over the day with programable measuring interval.